Pickled Marlin (Numus) | Gourmet from the galley! 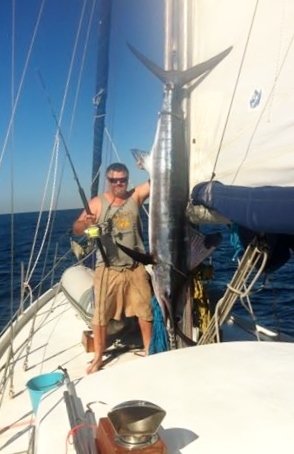 Sailing between Port Stephens and Coffs Harbour in NSW we caught a blue marlin. It was amazing! After two hours of reeling him in and letting him run, the game finally ended with us the victors and a freezer full of marlin. Read about The Marlin! We have 55 bags of frozen marlin steaks, around ten bags of belly flaps and other off cuts to use in curries, pies etc and with the last of the meat that we got off the marlin (the scraps on the bones), I made pickled marlin. I boiled white vinegar, brown sugar, mustard, fennel and coriander seeds, peppercorns, garam masala and chilli. I added sliced onion to the vinegar mix after I had taken it off the heat. I then set the vinegar and onions aside for about 1 hour until the mix had cooled. The final step was to simply add the marlin. Viola! Pickled marlin. Pickled marlin ready to eat. For this pickled fish, I simply mixed white vinegar, soy, lime juice, chilli, garlic and brown sugar. I then layered the marlin and sliced onion in a container and poured the vinegar mix over it. Done and very delicious if I do say so myself! Marlin Numus ready to eat.